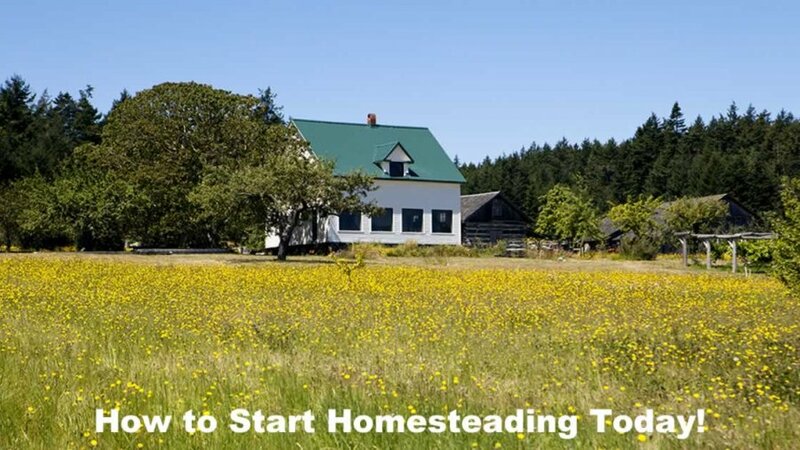 9 Easy Steps on How to Start Homesteading Today! Home Emergency Preparedness 9 Easy Steps on How to Start Homesteading Today! Our homesteading efforts can best be described as accidental. When we left Southwest Florida for the Missouri Ozarks, we were not on a prepping or homesteading mission. We were just looking for a change of pace, a safer place to raise our kids, and a fresh start financially. I was not yet into prepping for the long haul, and I was certainly not thinking of a homesteading lifestyle. I wanted to plant a few fruit trees, have a couple horses, and maybe raise a few alpacas. Everything that has followed has just sort of sprung forth as my awareness of the tenuous nature of the social fabric has developed, and has burst into being as one “great idea” after another has been acted upon in no particular order. It is only in the past year or so that the idea of self sufficiency and homesteading has truly begun to sink in. I have had much cause to consider the roller-coaster ride we have been on, and to consider what I would have done differently had I actually known what we were doing. The bulk of our learning has been through our mistakes, but learn we have. The biggest lesson that I have learned is the value of a plan. Had I entered into my self sufficiency adventure knowing that it was indeed a homesteading adventure, I would have planned things out more carefully, and I would have attacked the problem with a more systematic approach. A great deal of time and money could have been saved, and results could have been achieved more quickly and with a lot less sweat and pain. For example, developing a small orchard was one of our homesteading goals from the get go (one of the few that was clearly stated). In the pursuit of this, we selected a location on our property based on lay of the land, open space, and sun exposure. We then tested the soil, fenced off the area and began acquiring trees and putting them in the ground, amending the soil in our plantings to match the needs of the selected trees. Tree selection was based on several factors. One factor was what types of fruit we wanted and knew would grow in our region. The Biggest factor, however, was which appropriate trees were on sale through our planting process. I am happy to report that the orchard is doing great and is an essential component of our self sufficiency. Having a homesteading plan and working it proved to be a good strategy. For tips on purchasing property go here purchasing investment property. Proper site selection and knowing about our soil has led to happy and healthy fruit trees, steadily maturing in a defined space that still has room for expansion. This, as it turns out, is how all homesteading projects should be planned. Evaluate, set goals based on needs and the results of your evaluation, then proceed in a step wise fashion as time and funding are available. This is also how your big picture plan should be developed. Your goals may differ based on your land and your tastes, but this is a pretty good blueprint for food homesteading. Once you have evaluated your land and set your goals you will need to prioritize, and allocate time and resources accordingly. The best approach is to treat your plan like a debt snowball, take the projects on from smallest to biggest. Taking this approach will lead you to early successes, foster confidence, and prime you for larger more long term projects to come. It will also allow you to develop your skills and build your knowledge in smaller and more easily digestible bites. In general, this means that plants should come before animals. Growing fruits and vegetables is less expensive than raising livestock, and gardens seldom escape from their fences and disappear into the woods. Proper fences should also come before animals when homesteading. We violated this rule with our goats. They came to us on the wings of a whim. One day we had the idea that goats would be cool, and goat milk would cut the grocery bill. Shortly after the initial thought the goats arrived, but fencing had not been thoroughly considered. What ensued was a battle of wills, and a series of quick fixes that seldom held up to the rigors of the herd. The goats were a good idea, and have been a valuable addition, but putting the goat before the fence has caused a lot of damage to our gardens and fruit trees. All of this could have been avoided with proper planning and a logical sequence of events. Spending the time and money to get the fences right from the start would have cost less of both in the long run. Preserving the fruits of your labors, unless you plan on dieting all winter, is a very important part of a homesteading lifestyle. Developing your canning and drying skills should be a top priority, even before the crops start rolling in. Funds should be allocated for equipment and supplies, and no effort should be spared in gaining knowledge in this area. Put food preservation at the top of your learn list. Keeping things running is also very important. It is a very good idea to put equipment maintenance and repair skills high on the learn list. Taking your tractor to the shop will cost you at least a day’s work, and there could come a time when the shop isn’t open. The ability to do-it-yourself is a big asset in self-sufficiency, and an ounce of prevention is worth a ton of cure. The road to self sufficiency can be a rocky one, but nothing irons out the bumps better than a good plan. Evaluate your resources, set your goals, prioritize, and attack your goals in step wise fashion. Don’t waver or jump into anything based on whims or emotions. Work your projects smallest to largest, and allocate your funds and your time accordingly. If you plan the work, work the plan, and gather knowledge and skills along the way you will be able to achieve great things on your homestead.